This is a letter that I send home at the beginning of year to explain the classroom behavior system to the parents. 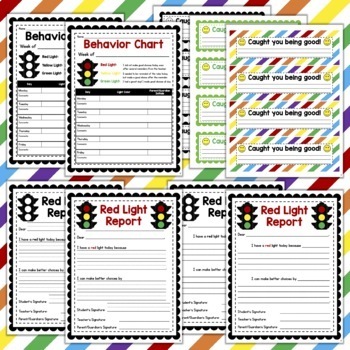 I used this behavior chart in my student's Take Home Folder. In my classroom, I use a light system to monitor behavior throughout the day. 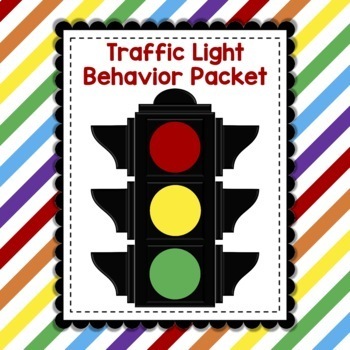 At the end of the day the student's are responsible for coloring in the block for the day, either green, yellow, or red to reflect their behavior and then I initial the box to ensure the have correctly recorded their behavior for the day. I also require the parents to initial each night to let me know they have seen the behavior chart. I use the comment section to relay to the parents any issues or accomplishments that the child had throughout the day or the parent can comment in that section back to me about any follow-up they have. 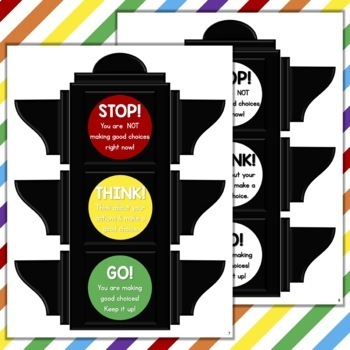 Later in the year I will often have the student write what their bad choices were for the day and what the consequences were for their action or what good choices they had made for the day. I print this out on card stock and laminate it to post by the "How are we doing today?" pocket chart as a reminder. I cut these out and keep them in a basket on my table. Anytime I see a student making exemplary choices, I fill out what I caught them doing as a way to celebrate good behavior. I send the slip home in the student's home folder so the parents can see what their child was doing well with at school that day. 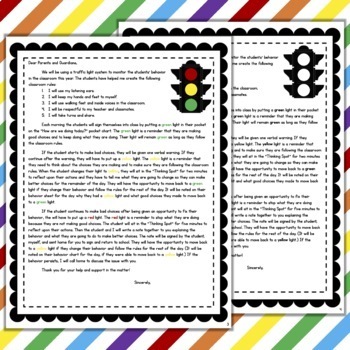 I use this form when a student has a red light. At the beginning of the year, I transcribe what the student says on the form. As the year progresses, the student takes over the responsibility of filling out what choices they made and what actions they are going to take to fix the problem.